Oliver Ames, 0 @ North Attleboro, 0 – Final – Click here for a Photo Gallery from this game. North Attleboro, 0 @ Oliver Ames, 0 – Final – Oliver Ames sophomore goalie Emma O’Donnell saved a penalty kick late in the second half to preserve the draw for the Tigers. OA head coach Britt Sellmayer aid senior Brianna Gibson and senior Gabrielle McLaughlin played well. North coach Bill Wallace called it a “good back and forth game.” He added that Emma Gaulin covered a lot of ground in the midfield and the back line of Lydia Hershey, Sam Hawkins, Bri Westcott, Morgan Silver, and Olivia Bishop all played well. Emma Noreck earned the clean sheet in goal for North. Mansfield, 3 @ Attleboro, 0 – Final – Sophomore Abby Varricchione scored just over halfway through the second half to break a scoreless tie to give the Hornets the lead for good. Alicia Hottleman secured the win with a pair of goals in the final 10 minutes. Click here for a photo gallery of this game. North Attleboro @ Stoughton – Postponed to a date and time to be announced. Attleboro, 221 @ Milford, 222 – Final (5 Cards) – After being tied at 175 through four cards, the match went to a fifth card and Attleboro emerged with a one-stroke win. Attleboro’s Ethan Johnson and Milford’s Riley Lynch were co-medalists, each shooting 40 on the day. Foxboro, 172 @ Canton, 155 – Final – Canton’s Chris Lavoie fired a 1-over par round of 35 at Blue Hill Country Club to pace the Bulldogs to a win over visiting Foxboro. Tommy Dimock added a round of 38 while Mike Gobbi carded a 39. Jon Dowling and Noah Hicks each shot 42 for Foxboro. Stoughton @ Sharon – Postponed to a date and time to be announced. NORTH EASTON, Mass. – North Attleboro kept probing, trying to find a hole in an Oliver Ames defense, but the Tigers held resolute for 66 minutes of Wednesday night’s meeting of defending league champions at Muscato Stadium. Despite North controlling the lion’s share of the possession, it looked like the Tigers would come away with a point. In the 67th minute, with the help of a massive deflection (and according to the OA bench, a handball on the edge of the box), North found the breakthrough. The first one opened the floodgates and the potent Rocketeers attack put the result beyond doubt, scoring four goals in the final 13 minutes of the game to pick up an impressive 4-0 road win. “We played a pretty good first half and I don’t think we played better in the second half, but we finished,” said North coach Bill Wallace. After a strong opening half in which it forced OA keeper Regan Benton into five saves (although none that were particularly demanding), North had two golden scoring chances in the first five minutes after the break. Ashlyn Gaulin got on the end of Haley Guertin’s flicked header, but flashed her shot just past the outstretched hand of Benton and past the post. Two minutes later, Guertin cut in from the right and teed up Kayla Pasquel who made an unmarked run down the left wing, but the junior’s first-time shot was pulled wide. 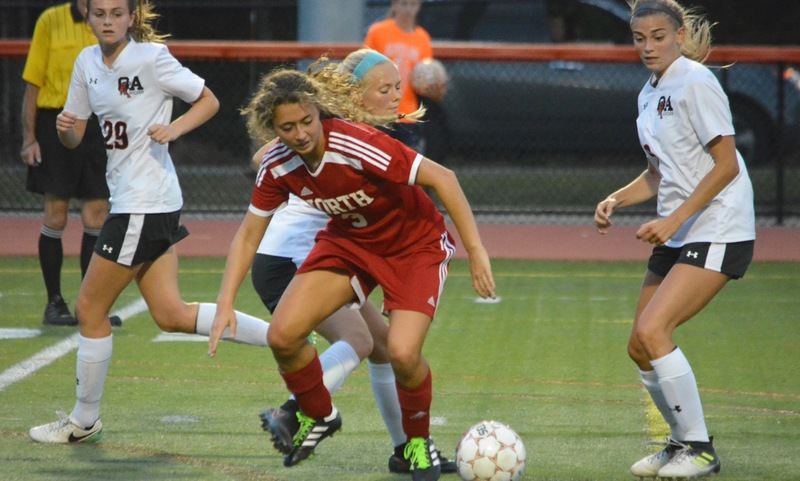 North was dominating possession and controlling the midfield led by senior Aine Mendonca. The young Tigers were struggling to keep the ball against the North press, but when North went forward the OA defensive unit of Maeve Hogan, Athena Sarafoglou, Brianna Gibson, and Gabrielle McLaughlin had an answer. In the 67th minute, North had a long free kick and senior Rachel Labonte played it to Guertin on the edge of the box. Her first effort was blocked but the ball rebounded back to the forward, who took another touch and had a second go. This shot took a huge deflection that wrong-footed Benton and found the back of the net. Just two minutes later, North doubled its lead. Pasquel took the ball down the outside on the left and got to the byline before crossing to the back post where Mackenzie Rosenberg had found a foot of space. The sub pulled it down, took a touch and hit a half-volley to make it 2-0. Down by two goals, OA still could not find a way to create a chance for Abby Reardon, Jackie Mills, or Anabella Walsh. Sellmayer credited the North defense, including center backs Emily Chiasson and Labonte, and especially right back Sam Hawkins. In the 72nd minute, North sealed the points with a third goal. Haley Ferrin flicked the ball into the box and it ricocheted past Benton, who had slid out to stop the first shot. Leah Jette was on hand to tap in. Ally Blaisdell wrapped it up directly off a corner (which came after the best of Benton’s 11 saves) when her cross bounced at the near post and skipped into the back of the net. North Attleboro (2-1) will put its two-game win streak on the line on Friday when it travels to Davenport division rival Canton. Oliver Ames (3-1) faces a tough trip to unbeaten Franklin. Sharon, 1 @ Norwood, 1 – Final – Sharon senior Andy Reyes-Jones nodded home the equalizer in the late stages of the game to help the Eagles earn a point on the road. 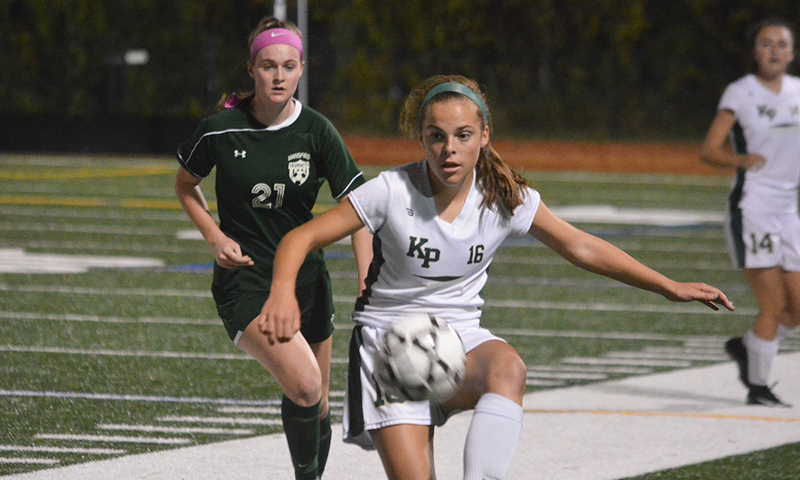 King Philip, 4 vs. Bishop Feehan, 3 – Final – Abby Baker scored with 5:13 left in the game to hand King Philip a non-league victory in the season opener. Chloe Layne opened the scoring in the first half and Avery Snead made it 2-0 with a goal off an assist by Makayla Griffin. Feehan bounced back to equalize in the second half, but Snead added her second of the game to give the Warriors back the lead off a Baker assist. The Shamrocks tied it again inside final 10 minutes but Baker scored a winner to start KP’s season with two points. Oliver Ames, 4 @ Brockton, 0 – Final – Annabella Walsh, Leah Johnson, Anna Tempestoso, and Abby Hodges scored the goals for the Tigers and Regan Benton picked up the clean sheet in goal. According to OA coach Britt Sellmayer, Sophia Cox and Gabrielle McLaughlin both had strong games for the Tigers in the season opener. Sharon, 6 vs. Norwood, 0 – Final – Ally Filipkowski took over the game after 30 minutes, said Sharon coach Brad Furnival, and scored all six of the goals for the Eagles in a strong season opening victory. Bridget McManus had a pair of assists for Sharon. Taunton, 3 vs. New Bedford, 1 – Final – Taunton opened the season with a non-league win and eighth grader Angie Lynch marked her varsity debut with a goal and assist. Paige Tolan and Sam Tichelaar scored goals for the Tigers, while Izzy DaCosta and Alexis Faria had assists. Oliver Ames, 152 @ Mansfield, 170 – Final – Oliver Ames senior Ryan McGarry battled windy conditions to shoot par (35) and earn match medalist honors. Liam Barry added a 38 for OA while Thomas Walsh carded a 39.